For a couple to make it to their 50th wedding anniversary is quite a feat. If your parents or other family members are about to celebrate that golden anniversary, throw them an extra-special party. The tables at the event should have items or centerpieces that reflect the lives of the happy couple. 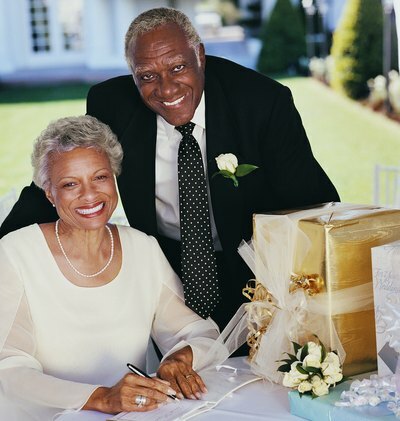 Plan a meaningful party for a couple celebrating 50 years together. Have a framed photograph of the couple on each table. They could all be the same, such as the couple's wedding picture. Or you could mix it up and have different pictures of the couple throughout their years together on different tables. Each table can represent a special memory or moment in the lives of the couple. If they took a road trip to the Grand Canyon once, have a note with a funny story that happened to them along the way. Decorate the table with little toy cars and cacti, and have a picture of them in the Grand Canyon at the center. If they got snowed in for a week one year, decorate a table with snowflake confetti and snow globes. Try to capture the essence of the story on each table. For an elegant affair, use golden-colored plates, gold napkins and wine glasses rimmed with gold. 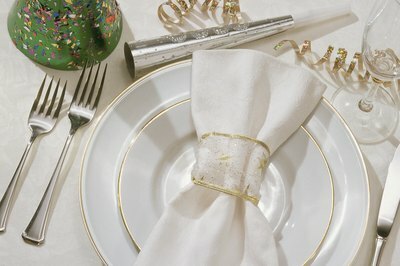 Alternatively, use gold linens for the table and contrast them using white plates with gold trim. Have a golden candle centerpiece and lightly sprinkle gold confetti on the table. 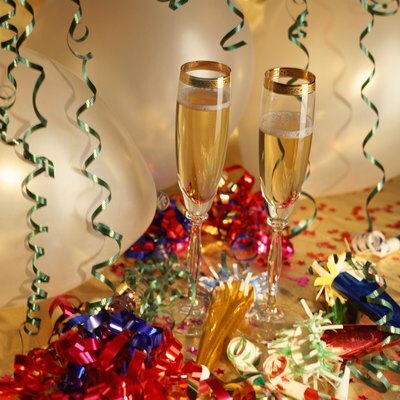 Provide champagne or a golden-hued wine like chardonnay on the tables as well. Decorate a box like a gift, but leave space at the top for a slot. Leave a pen and note paper at each place setting and ask guests to write a note of congratulations to the couple. The couple can go through the gift boxes later and see all their notes of love and appreciation.